The applications where near field infrared (IR) illumination is used continue to expand and grow. In addition to surveillance, applications include machine vision, numerous automotive functions, trafic control and gesture recognition. However IR illumination applications have some challenges. Illumination must be uniform and the beam angle should match the field of view of the camera. It is therefore important to use optics that meet the specific needs of each application. Without an optic IR LEDs cannot provide a beam pattern equal to the 4:3 aspect ratio of the majority of IR sensors. 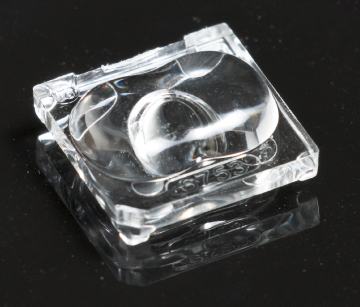 IRIE is LEDiL’s new low profile IR lens for near field applications for distances from 1–5 m and a wide field of angle. Optimized for a 4:3 aspect ratio IRIE has a unique batwing beam distribution for uniform irradiance. Designed for flat high power IR LEDs IRIE has a small 14 x 14 mm footprint capable of accommodating up to two LEDs. Made of durable PMMA and easy to attach using adhesive tape, IRIE has 94 % efficacy making it an excellent solution for numerous near field IR applications.